How to self hypnotize yourself for best best result you looking for. WHAT ARE THE BENEFITS OF THE COURSE TO ME? You will be trained exclusively by a Certified Clinical Instructor in Hypnotherapy with over 20 years experience as a mental health clinician in both private practice as well as in one of the finest psychiatric hospitals in the world. You will save time and money from not having an extended stay away from your office. Class Dates Scheduled Around Your Availability.You can pick and choose the training dates that are convenient for you. Your class dates can be scheduled all at once or at separate times, on weekdays or weekends as long as we have the dates available. Due to a limited amount of calendar days throughout the year, this training is scheduled on a first come first serve basis so you should call soon to secure your choices. We will customize your training to suit your specific needs. We realize that everyone has a different reason to attend training as there are so many opportunities available as a Hypnotherapist. 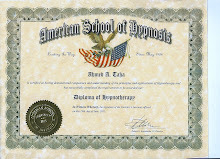 If you are interested in a certain area of hypnosis such as Past Life Regression or how to integrate hypnosis with your existing Mental Health or Counseling Practice then this may be the best option for you. We will be able to spend more time working on what you are interested in rather than wasting time on what you are not. "It does not have to be difficult to be worthwhile."